Two and a half months ago, I was at LumaCon, a small comic convention put on in Petaluma, California by local librarians to encourage kids to read and create art. It was a great little con that I reported on for AnimeCons TV and I hope inspires other similar conventions across the country. However, while I was there, I witnessed something which made me uncomfortable that I didn't mention in my report. 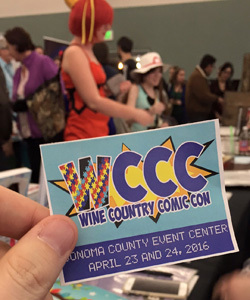 Someone came around distributing slightly larger than business card-size pieces of paper with information about Wine Country Comic Con. Since I had previously added the con to FanCons.com, I was familiar with it. I already knew I wouldn't be attending because it was scheduled for the same weekend as Kraken Con, my favorite Bay Area convention. I really didn't think much of it and went about my business. A few hours later, I was sitting and looking at the tiny flyer and a guy came up to me and accused the guy running Wine Country Comic Con of running a charity scam. He didn't give his name, but introduced himself as the organizer of Santa Rosa Toy Con, which was located in the same town as that Wine Country Comic Con. He told me that the organizer of Wine Country Comic Con went to Santa Rosa Toy Con's Facebook page and sent invites to everyone on there. Then he walked off. I could barely get two words in. He clearly wasn't interested in discussion and only making sure everyone thought that new convention was some kind of scam. I learned later that this organizer of Santa Rosa Toy Con was Mike Holbrook. The accusation was so uncomfortable and reflected so badly, that I made a vague blog post about it on February 1st to discourage other convention organizers from doing the same thing. I didn't mention names or conventions because they weren't important and I never expected there to be more to the story. Throughout the end of December and early 2016, I was seeing a lot of Facebook posts in various cosplay and artist groups that spammed about Wine Country Comic Con at least once per week. One of the most prolific spammers was named Frida Avila. A friend had noticed these posts in multiple other groups and did some Google searches based on the images found in Frida's relatively new Facebook profile. She discovered that all the photos of "Frida Avila" were actually photos of a Ukranian cosplayer named Liza Kostetskaya. Frida Avila was fake. Of course, I figured there must be more, but didn't have time to research it...so I tipped off the Nerd & Tie site in late February in case they wanted to look into it. ...and boy did they! On February 24th, Trae Dorn posted an article which exposed that fake account. Not long after the fake was exposed, the account was deleted...which can be interpreted as either an amazing coincidence or an attempt to cover up tracks after the truth was exposed. Mike Holbrook jumped into the comments on that first article with the names of other potential fake accounts and the claim that he has a letter from the charity Wine Country Comic Con planned to donate to was not affiliated with the convention and asked them to stop using their name. Brena had always promoted Wine Country Comic Con as a charitable event. He started by saying it would benefit the Early Learning Institute. According to the article, Brena had no affiliation with the Early Learning Institute. Language was later changed to claim he was building an "Early Learning Center" and no specific charity. As for Brena himself, his Brena Outreach Strategies organization used to have the Attack on Titan Survey Corps insignia in his logo...until he took down his web site for "maintenance" shortly after the article was published. (You can still see it through Archive.org because nothing can truly be erased from the Internet.) The company's Facebook page has been changed into yet another Wine Country Comic Con page. In the weeks that have passed since those articles were published by Nerd & Tie, Mike Holbrook seized the opportunity to post links to those articles and attempt to make all potential attendees aware of the situation. Similar to the behavior I saw from him at LumaCon, this was a bad strategy. Bad mouthing the competition is never, ever a good strategy and makes you look unprofessional. This resulted in the creation of a Facebook group called "Comic Con Controversy" which started by discussing cyberbullying, but quickly changed into outright accusing Mike Holbrook of being a cyberbully and that the negative articles were because of him. Of course, it wasn't Mike that had created the Facebook accounts and he's not the one that wrote the Nerd & Tie articles about the red flags the con has raised. The creator of this group tried to remain anonymous, but an article on Bleeding Cool revealed that the author left too many clues to his identity. In a follow-up article, Bleeding Cool reported that Jeff Sterck admitted he was behind the group. Jeff Sterck is the son Pat Sterck, the president of the Roseland Lion's Club. The same Lion's Club to which Uriel Brena belongs. Throughout all of this, Wine Country Comic Con's guest list has been changing so often that it's hard to keep up. There have been (as of April 16th) seventeen guest cancellations. Many of the latest additions are local guests. Some of the cancelled guests are now booked at Kraken Con in Oakland, about an hour away. As a first-year convention in a small city, it would be no surprise if attendance was light. However, with two established conventions (Kraken Con and BABSCon) scheduled less than an hour away on the same weekend, that would cut into attendance even more. Factor in the extremely popular Butter & Egg Days Parade & Festival just 15 minutes south in Petaluma (along with associated traffic issues on Highway 101) and you've probably got a hard time trying to convince people to attend. Once you factor in all the negative press and the guests who have dropped, there can't possibly be enough people attending this convention to cover costs of the facility and (remaining) guests. Will the convention still happen? I don't doubt it. If Uriel Brena hasn't cancelled by this point, he'll never cancel. Would I go even if I didn't have other plans? No way.